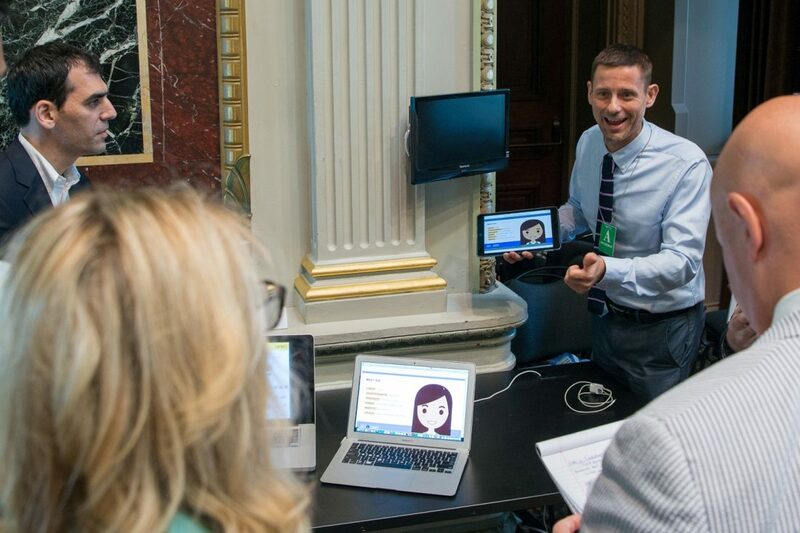 Last Wednesday, First Lady Michelle Obama announced ThinkZone Games, based in New York, won the grand prize in the Reach Higher Career App Challenge run by the White House and the U.S. Department of Education. The win gives ThinkZone some $100,000 in cash, plus access to additional software development and other services. Scott Brewster, co-founder and chief operating officer with ThinkZone Games, says the company created Hats & Ladders, a game app that helps students think about their college plans and potential career paths. Borrowing the now-common swipe left or right feature found in popular dating apps, users of Hats & Ladders can assess what suits their interests in the professional world and how education may help get them there. The app is still in development, with plans for an alpha test to begin next spring, says Brewster (pictured above, demoing the app). The app challenge was an initiative to help narrow the skills gap in the populace by finding new ways to better connect students with possible careers. ThinkZone, a collaborative effort by 3C Institute, Triad Interactive Media, Academic Business Advisors, and Electric Funstuff, created Hats & Ladders as an original app for the competition, Brewster says. Applications started to come in last October for the competition, with five finalists later selected to participate in a virtual accelerator program that ran through the spring. The finalists then sought to impress judges at a demo day held in July at the White House. A lot of attention has been put on education at all levels these days, with calls for early introductions to science, technology, engineering, and math. 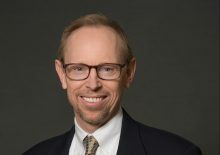 There is also an expectation that classrooms will increasingly use modern technology, but it is not always easy to incorporate such elements into academia, Brewster says. Part of the problem is finding ways to make the technology more accessible and affordable; there is also the matter of changing the status quo in the education world. “There is a longstanding relationship between the textbook companies that have their foot in the door at school systems,” Brewster says. School administrators and district leaders are gradually embracing new innovations for education, he says, yet they must also balance the financial cost of procuring technology. One area he says administrators are particularly interested in is the development of non-cognitive skills that students need, such as research skills and time management. ThinkZone, Brewster says, wants to work with such officials to make technology more ubiquitous and to help address those needs among students. Brewster says ThinkZone saw a gap in career education, especially among kids in middle school. Getting them to think about possible professions earlier on may put them on better footing to pursue those ambitions, he says. The plan is to allow such students access to the Hats & Ladders game through their school counselors, homeroom teachers, or other teachers, he says. By exploring the app, students can become better informed about fields of study they might have otherwise overlooked. “A lot of kids know what science is, but they may not know the breadth of career options in that domain,” Brewster says. ThinkZone Games will spend the coming months preparing Hats & Ladders for its first alpha test in spring 2017. The attention from winning the competition has increased interest in the app. The original plan, Brewster says, was to test Hats & Ladders with about 40 schools. After the First Lady announced the grand prize winner, ThinkZone has been inundated by e-mails from teachers interested in learning more about the app. There are other products in ThinkZone’s notebook, such as history game Mission U.S., which is used at schools across the country. ThinkZone has a staff of seven operating out of the New York offices of Electric Funstuff. The team is also working on creating a portal to bring together third-party education games in one place. After the company gets feedback from the Hats & Ladders alpha test, Brewster says, ThinkZone will determine how it should proceed with further development. That may include seeking federal funding and seeking dialogues with the venture capital community. “We want games to be thought of as a common part of the classroom,” he says.